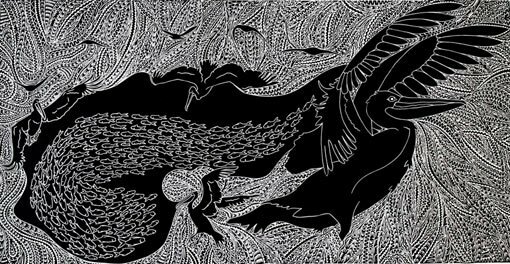 On 28 October, the Gallery opens Glen Mackie and Daniel O’Shane , a new exhibition presenting the work of two artists with individual practices who are currently at the forefront of contemporary Torres Strait Islander printmaking. 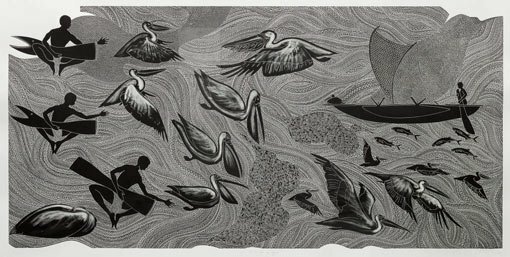 Artists from the Torres Strait Islands in Australia’s north have experimented with different forms of printmaking, most notably linocuts and vinylcuts, since the mid 1980s. This has led to the development of a unique style that is now synonymous with the region. Employing finely executed blocks, these works combine detailed graphic designs with realistic figurative forms, generally printed in hard-edged black on white. Over time and through collaborations with master printmakers, artists have produced works on an ever-increasing scale, capturing the complexity of diverse narratives that are distinct to the Torres Strait Islands. Since 2015, the Gallery has enriched its holdings of contemporary prints from the Torres Strait Islands with the acquisition of several works by Glen Mackie (b1975) and by Daniel O’Shane (b1990). Glen Mackie (Kei Kalak) has been involved in the Torres Strait Islander print movement since the 1990s. Taught to carve and paint by members of his extended family, he explores both family stories and environmental issues in his works. Mackie uses a distinct minar, or infill design, which is informed by his family’s design. This inverted water pattern is repeated across his works, giving a sense of ebb and flow of the tides, and is evocative of his home environment. In The coming of Sigai 2013, Mackie uses to great effect detailed kaidarral, or hand colouring, which adds depth and dimension to the figurative elements that seem to emerge from the geometric linework. Sigai is one of four brothers who travelled from the north before memory and settled in the central and eastern Torres Strait, with Sigai holding responsibility for Yam Island. As the only practising artist from Yam Island, Mackie feels a particular obligation to keep alive the knowledge of Sigai and his brothers, who remain central to the identity of the region. Mackie constantly works to expand the possibilities of the print medium. This is best demonstrated by The Githalai Effect I 2015, a four-metre work that cascades off the wall, trailing on the ground to become a three-dimensional form, overlaid with marine creatures. When viewed in combination, these creatures create the form of an individual, complete with headdresses and adornment of ceremony. Daniel O’Shane is among the younger generation of Torres Strait Islander artists and he has quickly established himself as a leading printmaker. O’Shane’s practice is characterised by the dramatic scale of his prints and a proficiency in carving, producing works of exquisite detail that are alive with movement. 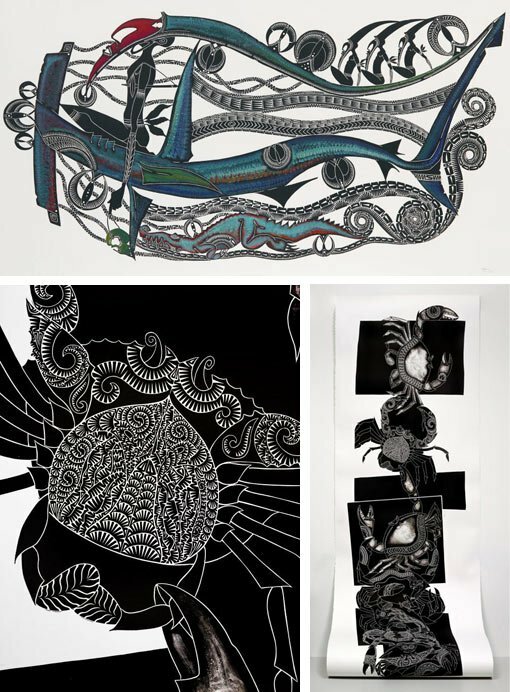 O’Shane’s prints are informed by the complex knowledge systems of Torres Strait Islander culture. Approaching each work as a form of storytelling, he embeds the major protagonists and events of the narratives he documents within fine geometric patterning. This perceptive use of intricate linework imbues his prints with a sense of constant movement and action, conveying the living and dynamic aspects of Torres Strait Islander culture that inform the here and now. The acquisition of Glen Mackie’s and Daniel O’Shane’s works by the Art Gallery of NSW was made possible through the generosity of Vicki Olsson, a long-term benefactor with a particular interest in Indigenous art.